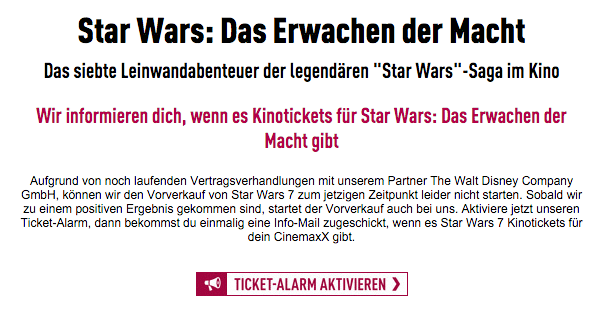 Small and independent cinemas in Germany are threatening to boycott Disney/Lucasfilm’s “Star Wars: the Force Awakens” over unfavourable screening terms. Amongst many points of contention Disney is said to be enforcing a minimum ticket price that is seen as too high for small towns, according to Karl-Heinz Meier, a member of the cinema trade body HDF Kino. As soon as negotiations are resolved patrons will be able to buy tickets, the message goes on to explain (see below). Cinemaxx refused to comment on the on-going discussions with Disney. Some 193 German cinema boycotted Disney’s “Avengers: Age of Ultron” in April this year over a similar dispute when rental terms were increased from 47.7% to 53%. The boycott is also said to have affected subsequent Disney releases in Germany. The new “Star Wars” film has been breaking sales records in Germany, as elsewhere, with CineStar reporting that it has sold 40,000 in less than a week, with 10,000 tickets alone for the midnight preview shows. However, the dispute clearly demonstrates the hardening negotiation climate between distributes and exhibitors over rental terms, with only the largest international cinema chains having sufficient clout to push for favourable terms.